We’ve been thinking about cocktails here at the Kranepool. Maybe a bit more than we ought to, when the night’s business is at hand. We thought the Kranepool Bar & Grille ought to have a namesake cocktail. Might attract customers. Can’t hurt. We spread the word, through the night-wire. We don’t get a whole lot of supermodels here at the Kranepool. Or let’s say, not yet. But mixing, stirring and shaking help keep one slim, and also help one cut a good figure at the bar. Word spreads. 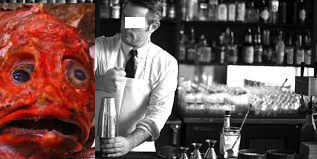 Word gets around, but deeds not words get cocktails made, and drunk. Pensiamo ai cocktail, qui all’Hotel Kranepool. Forse più di quanto dovremmo, in quelle notti in cui c’è poco da fare. Ci sembrava che il Kranepool Bar & Grille dovrebbe avere un eponimo cocktail. Potrebbe attirare clienti. Male, in ogni caso, non può fare. Passammo parola, per i telegrafi della notte. Finora non abbiamo ospitato tantissime supermodelle, qui al Kranepool. Ma i cocktail ben torniti aiutano a mantenere elegante la linea, e a fare bella figura davanti al banco.